Not to be confused with Microsound. "Microtone" redirects here. For the slicing tool, see Microtome. Microtonal music or microtonality is the use in music of microtones—intervals smaller than a semitone, also called "microintervals". It may also be extended to include any music using intervals not found in the customary Western tuning of twelve equal intervals per octave. In other words, a microtone may be thought of as a note that falls between the keys of a piano tuned in equal temperament. Microtonal music can refer to any music containing microtones. The words "microtone" and "microtonal" were coined before 1912 by Maud MacCarthy Mann in order to avoid the misnomer "quarter tone" when speaking of the srutis of Indian music (Mann 1912, 44). Prior to this time the term "quarter tone" was used, confusingly, not only for an interval actually half the size of a semitone, but also for all intervals (considerably) smaller than a semitone (Ellis 1877, 665; Meyer 1903). It may have been even slightly earlier, perhaps as early as 1895, that the Mexican composer Julián Carrillo, writing in Spanish or French, coined the terms microtono/micro-ton and microtonalismo/micro-tonalité (Donval 2006, 119). In French, the usual term is the somewhat more self-explanatory micro-intervalle, and French sources give the equivalent German and English terms as Mikrointervall (or Kleinintervall) and micro interval (or microtone), respectively (Amy 1961; Anon. 1998; Wallon 1980, 13; Whitfield 1989, 13. "Microinterval" is a frequent alternative in English, especially in translations of writings by French authors and in discussion of music by French composers (Battier and Lacino 1984, 79; Boulez 1958, 22–23; Rae 2013, 164, 174n40). In English, the two terms "microtone" and "microinterval" are synonymous (Maclagan 2009, 109). The English analogue of the related French term, micro-intervalité, however, is rare or nonexistent, normally being translated as "microtonality"; in French, the terms micro-ton, microtonal (or micro-tonal), and microtonalité are also sometimes used, occasionally mixed in the same passage with micro-intervale and micro-intervalité (Donval 2006, 119, 183; Jedrzejewski 2014, passim; Rigoni 1998, 314). Ezra Sims, in the article "Microtone" in the second edition of the Harvard Dictionary of Music (Apel 1974, 527) defines "microtone" as "an interval smaller than a semitone", which corresponds with Aristoxenus's use of the term diesis (Richter 2001). However, the unsigned article "Comma, Schisma" in the same reference source calls comma, schisma and diaschisma "microintervals" but not "microtones" (Apel 1974, 188), and in the fourth edition of the same reference (which retains Sims's article on "Microtone") a new "Comma, Schisma" article by André Barbera calls them simply "intervals" (Barbera 2003). In the second edition of The New Grove Dictionary of Music and Musicians, Paul Griffiths, Mark Lindley, and Ioannis Zannos define "microtone" as a musical rather than an acoustical entity: "any musical interval or difference of pitch distinctly smaller than a semitone", including "the tiny enharmonic melodic intervals of ancient Greece, the several divisions of the octave into more than 12 parts, and various discrepancies among the intervals of just intonation or between a sharp and its enharmonically paired flat in various forms of mean-tone temperament", as well as the Indian sruti, and small intervals used in Byzantine chant, Arabic music theory from the 10th century onward, and similarly for Persian traditional music and Turkish music and various other Near Eastern musical traditions (Griffiths, Lindley, and Zannos 2001), but do not actually name the "mathematical" terms schisma, comma, and diaschisma. "Microtone" is also sometimes used to refer to individual notes, "microtonal pitches" added to and distinct from the familiar twelve notes of the chromatic scale (Von Gunden 1986, 59), as "enharmonic microtones" (Barbieri 2008, 139), for example. In English the word "microtonality" is mentioned in 1946 by Rudi Blesh who related it to microtonal inflexions of the so-called "blues scales" (Blesh 1946, 234). It was used still earlier by W. McNaught with reference to developments in "modernism" in a 1939 record review of the Columbia History of Music, Vol. 5 (McNaught 1939, 102). In German the term Mikrotonalität came into use at least by 1958 (Prieberg 1958, 288; Prieberg 1960, 29–32, 210–12, inter al), though "Mikrointervall" is still common today in contexts where very small intervals of early European tradition (diesis, comma etc.) are described, as e.g. in the new Geschichte der Musiktheorie (Zaminer 2006, 94) while "Mikroton" seems to prevail in discussions of the avant-garde music and music of Eastern traditions. The term "microinterval" is used alongside "microtone" by American musicologist Margo Schulter in her articles on medieval music (Schulter 1998; Schulter 2001). The term "microtonal music" usually refers to music containing very small intervals but can include any tuning that differs from Western twelve-tone equal temperament. Traditional Indian systems of 22 śruti; Indonesian gamelan music; Thai, Burmese, and African music, and music using just intonation, meantone temperament or other alternative tunings may be considered microtonal (Griffiths and Lindley 1980; Griffiths, Lindley, and Zannos 2001). Microtonal variation of intervals is standard practice in the African-American musical forms of spirituals, blues and jazz (Cook and Pople 2004, 124–26). Many microtonal equal divisions of the octave have been proposed, usually (but not always) in order to achieve approximation to the intervals of just intonation (Griffiths and Lindley 1980; Griffiths, Lindley, and Zannos 2001). Terminology other than "microtonal" has been used or proposed by some theorists and composers. In 1914, A. H. Fox Strangways objected that "'heterotone' would be a better name for śruti than the usual translation 'microtone'" (Strangways 1914, 127n). Modern Indian researchers yet write: "microtonal intervals called shrutis" (Datta, Sengupta, Dey, and Nag 2006, 18). In Germany, Austria, and Czechoslovakia in the 1910s and 1920s the usual term continued to be Viertelton-Musik (quarter-tone music; Möllendorff 1917,[page needed]), and the type of intervallic structure found in such music was called the Vierteltonsystem (Hába 1921,Hába 1922), which was (in the mentioned region) regarded as the main term for referring to music with microintervals, though as early as 1908 Georg Capellan had qualified his use of "quarter tone" with the alternative term "Bruchtonstufen (Viertel- und Dritteltöne)" (fractional degrees (quarter and third-tones)) (Capellen 1908, 184). Despite the inclusion of other fractions of a whole tone, this music continued to be described under the heading "Vierteltonmusik" until at least the 1990s, for example in the twelfth edition of the Riemann Musiklexikon (Riemann 1967, 1032–33), and in the second edition of the popular Brockhaus Riemann Musiklexikon (Dahlhaus, Eggebrecht, and Oehl 1995, 304). Ivan Wyschnegradsky used the term ultra-chromatic for intervals smaller than the semitone and infra-chromatic for intervals larger than the semitone (Wyschnegradsky 1972, 84–87); this same term has been used since 1934 by ethnomusicologist Victor Belaiev (Belyaev) in his studies of Azerbaijan and Turkish traditional music (Belyaev 1971a; Belyaev 1971b). A similar term, subchromatic, has been used recently by theorist Marek Žabka (Žabka 2014). Ivor Darreg proposed (where and when?) the term xenharmonic. (See xenharmonic music). The Austrian composer Franz Richter Herf and his colleague at the Salzburg Mozarteum, the music theorist Rolf Maedel, preferred using the Greek word ekmelic when referring to "all the pitches lying outside the traditional twelve-tone system" (Hesse 1991, 216–17). Some authors in Russia (Anon. 1990; Anon. 2007; Akopyan 2010; Tsenova 2007, 65, 123, 152, etc. ; Anon. 2006, 86, etc. ; Kholopov 2003, 172, etc. ), and some musicology dissertations (Klishin 2010; Gurenko 2010; Polunina 2010; Rovner 2010; Nikoltsev 2013, more references can be located here) disseminate the term микрохроматика (microchromatics), coined in the 1970s by Yuri Kholopov (Kholopov 1976), to describe a kind of 'intervallic genus' (интервальный род) for all possible microtonal structures, both ancient (as enharmonic genus—γένος ἐναρμόνιον—of Greeks) and modern (as quarter-tone scales of Alois Haba); this generalization term allowed also to avoid derivatives such as микротональность (microtonality, which could be understood in Russian as a sub-tonality, which is subordinate to the dominating tonality, especially in the context of European music of the 19th century) and микротоника (microtonic, "a barely perceptible tonic"; see a clarification in (Kholopov 2000)). Another Russian authors use more international adjective 'microtonal' and rendered it in Russian as 'микротоновый', but not 'microtonality' ('микротональность') (Kogut 2005; Adèr 2013; Pavlenko, Kefalidi, and Ekimovskij 2002; etc. ). However are used 'микротональность' and 'микротоника' also. Some authors writing in French have adopted the term "micro-intervallique" to describe such music (e.g., Criton 2010; Jedrzejewski 2004). Italian musicologist Luca Conti dedicated two his monographs to microtonalismo (Conti 2005; Conti 2008), which is the usual term in Italian, and also in Spanish (e.g., as found in the title of Rué 2000). The analogous English form, "microtonalism", is also found occasionally instead of "microtonality", e.g., "At the time when serialism and neoclassicism were still incipient a third movement emerged: microtonalism" (Chou 1971, 218). The term "macrotonal" has been used for intervals wider than twelve-tone equal temperament (Anon. n.d.), or where there are "fewer than twelve notes per octave," though "this term is not very satisfactory and is used only because there seems to be no other" (Pressing 1992, 239). 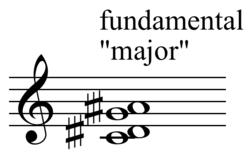 The term "macrotonal" has also been used for musical form (Spring and Hutcheson 2013, 82). Greek Dorian mode (enharmonic genus) on E, divided into two tetrachords. The Hellenic civilizations of ancient Greece left fragmentary records of their music—e.g. the Delphic Hymns. The ancient Greeks approached the creation of different musical intervals and modes by dividing and combining tetrachords, recognizing three genera of tetrachords: the enharmonic, the chromatic, and the diatonic. Ancient Greek intervals were of many different sizes, including microtones. The enharmonic genus in particular featured intervals of a distinctly "microtonal" nature, which were sometimes smaller than 50 cents, less than half of the contemporary Western semitone of 100 cents. In the ancient Greek enharmonic genus, the tetrachord contained a semitone of varying sizes (approximately 100 cents) divided into two equal intervals called dieses (single "diesis", δίεσις); in conjunction with a larger interval of roughly 400 cents, these intervals comprised the perfect fourth (approximately 498 cents, or the ratio of 4/3 in just intonation) (West 1992, 160–72). Theoretics usually described several diatonic and chromatic genera (some as chroai, "coloration" of one specific intervallic type), but the enarmonic genus was always the only one (argumented as one with the smallest intervals possible). Guillaume Costeley's "Chromatic Chanson", "Seigneur Dieu ta pitié" of 1558 used 1/3 comma meantone and explored the full compass of 19 pitches in the octave (Lindley 2001a). The Italian Renaissance composer and theorist Nicola Vicentino (1511–1576) worked with microtonal intervals and built a keyboard with 36 keys to the octave known as the archicembalo. While theoretically an interpretation of ancient Greek tetrachordal theory, in effect Vicentino presented a circulating system of quarter-comma meantone, maintaining major thirds tuned in just intonation in all keys (Barbour 1951, 117–18). In 1760 the French flautist [Charles?] De Lusse published a treatise, L'Art de la flute traversiere, all surviving copies of which conclude with a composition (possibly added a year or two after the actual publication of the volume) incorporating several quarter tones, titled Air à la grecque, accompanied by explanatory notes tying it to the realization of the Greek enharmonic genus and a chart of quarter-tone fingerings for the entire range of the one-keyed flute. Shortly afterward, in a letter published in the Mercure de France in September 1764, the celebrated flautist Pierre-Gabriel Buffardin mentioned this piece and expressed an interest in quarter tones for the flute (Koenig 1995, iii, 1, 9–10, 52–55, 116–19; Reilly and Solum 1992, passim). Jacques Fromental Halévy composed a cantata "Prométhée enchaîné" for a solo voice, choir and orchestra (premiered in 1849), where in one movement (Choeur des Océanides) he used quartertones, to imitate the enharmonic genus of Greeks. In the 1910s and 1920s, quarter tones (24 equal pitches per octave) received attention from such composers as Charles Ives, Julián Carrillo, Alois Hába, Ivan Wyschnegradsky, and Mildred Couper. Alexander John Ellis, who in the 1880s produced a translation of Hermann Helmholtz's On the Sensations of Tone, proposed an elaborate set of exotic just intonation tunings and non-harmonic tunings (Helmholtz 1885, 514–27). Ellis also studied the tunings of non-Western cultures and, in a report to the Royal Society, stated that they used neither equal divisions of the octave nor just intonation intervals (Ellis 1884). Ellis inspired Harry Partch immensely (Partch 1979, vii). During the Exposition Universelle of 1889, Claude Debussy heard a Balinese gamelan performance and was exposed to non-Western tunings and rhythms. Some scholars have ascribed Debussy's subsequent innovative use of the whole-tone (six equal pitches per octave) tuning in such compositions as the Fantaisie for piano and orchestra and the Toccata from the suite Pour le piano to his exposure to the Balinese gamelan at the Paris exposition (Lesure 2001), and have asserted his rebellion at this time "against the rule of equal temperament" and that the gamelan gave him "the confidence to embark (after the 1900 world exhibition) on his fully characteristic mature piano works, with their many bell- and gong-like sonorities and brilliant exploitation of the piano’s natural resonance" (Howat 2001). Still others have argued that Debussy's works like L'isle joyeuse, La cathédrale engloutie, Prélude à l'après-midi d'un faune, La mer, Pagodes, Danseuses de Delphes, and Cloches à travers les feuilles are marked by a more basic interest in the microtonal intervals found between the higher members of the overtone series, under the influence of Helmholtz's writings (Don 1991, 69 et passim). Emil Berliner's introduction of the phonograph in the 1890s allowed much non-Western music to be recorded and heard by Western composers, further spurring the use of non-12-equal tunings. Major microtonal composers of the 1920s and 1930s include Alois Hába (quarter tones, or 24 equal pitches per octave, and sixth tones), Julián Carrillo (24 equal, 36, 48, 60, 72, and 96 equal pitches to the octave embodied in a series of specially custom-built pianos), Ivan Wyschnegradsky (third tones, quarter tones, sixth tones and twelfth tones, non octaving scales) and the early works of Harry Partch (just intonation using frequencies at ratios of prime integers 3, 5, 7, and 11, their powers, and products of those numbers, from a central frequency of G-196) (Partch 1979, chapt. 8, "Application of the 11 Limit", 119–37). Prominent microtonal composers or researchers of the 1940s and 1950s include Adriaan Daniel Fokker (31 equal tones per octave), Partch (continuing to build his handcrafted orchestra of microtonal just intonation instruments), and Eivind Groven. Digital synthesizers from the Yamaha TX81Z (1987) on and inexpensive software synthesizers have contributed to the ease and popularity of exploring microtonal music. Electronic music facilitates the use of any kind of microtonal tuning, and sidesteps the need to develop new notational systems (Griffiths, Lindley, and Zannos 2001). In 1954, Karlheinz Stockhausen built his electronic Studie II on an 81-step scale starting from 100 Hz with the interval of 51/25 between steps (Stockhausen 1964, 37), and in Gesang der Jünglinge (1955–56) he used various scales, ranging from seven up to sixty equal divisions of the octave (Decroupet and Ungeheuer 1998, 105, 116, 119–21). In 1955, Ernst Krenek used 13 equal-tempered intervals per octave in his Whitsun oratorio, Spiritus intelligentiae, sanctus (Griffiths, Lindley, and Zannos 2001). In 1979–80 Easley Blackwood composed a set of Twelve Microtonal Etudes for Electronic Music Media, a cycle that explores all of the equal temperaments from 13 notes to the octave through 24 notes to the octave, including 15-ET and 19-ET (Blackwood and Kust 2005,[page needed]). "The project," he wrote, "was to explore the tonal and modal behavior of all [of these] equal tunings…, devise a notation for each tuning, and write a composition in each tuning to illustrate good chord progressions and the practical application of the notation" (Blackwood n.d.). In 1986, Wendy Carlos experimented with many microtonal systems including just intonation, using alternate tuning scales she invented for the album Beauty In the Beast. "This whole formal discovery came a few weeks after I had completed the album, Beauty in the Beast, which is wholly in new tunings and timbres" (Carlos & 1989–96). Aphex Twin has been making microtonal electronic music with software and various analog and digital synthesizers since his 1994 album, Selected Ambient Works Volume II (Noyze and James 2014). In 2016, electronic music composed with arbitrary microtonal scales was explored on the album Radionics Radio: An Album of Musical Radionic Thought Frequencies by British composer Daniel Wilson, who derived his compositions' tunings from frequency-runs submitted by users of a custom-built web application replicating radionics-based electronic soundmaking equipment used by Oxford's De La Warr Laboratories in the late 1940s, thereby supposedly embodying thoughts and concepts within the tunings (Murphy 2017). A form of microtone known as the blue note is an integral part of rock music and one of its predecessors, the blues. The blue notes, located on the third, fifth, and seventh notes of a diatonic major scale, are flattened by a variable microtone (Ferguson 1999, 20). Joe Monzo has made a microtonal analysis of the song Drunken-Hearted Man written and recorded by the delta blues musician Robert Johnson (Wilson, Penderecki, and Greenwood 2012). Musicians such as Jon Catler have incorporated microtonal guitars like 31-tone equal tempered guitar and a 62-tone just intonation guitar in blues and jazz rock music (Couture n.d.). English rock band Radiohead has used microtonal string arrangements in its music, such as on "How to Disappear Completely" from the album Kid A (Wilson, Penderecki, and Greenwood 2012). Australian band King Gizzard and the Lizard Wizard utilised custom microtonal guitars modified to play in 24-TET tuning and other microtonal instruments on their 2017 album Flying Microtonal Banana (Anon. 2016). American band Dollshot used quarter tones and other microtonal intervals in their album Lalande (Noah K and Rosie K 2018). Ferruccio Busoni (Italy, Germany, 1866–1924). Experimented with microtones, including third-tones. Adèr, Lidiâ Olegovna [Адэр, Лидия Олеговна]. 2011a. "Микротоновая идея: Истоки и предпосылки" [The Concept of Microtonality: Its Origin and Background]. Научный журнал Санкт-Петербургской консерватории [Opera musicologica: Naučnyj žurnal Sankt-Peterburgskoj konservatorii] 3-4, nos. 8-9:114–34. Adèr, Lidiâ Olegovna [Адэр, Лидия Олеговна]. 2011b. "Микротоновый инструментарий—первые шаги от утопии к практике" [Microtonal Instruments: The First Steps from Utopia to Practice]. In Временник Зубовского института: Инструментализм в истории культуры [Instrumentalism in the history of culture], edited by Evgenia Vladimirovna Hazdan, 52–65. Vremennik Zubovskogo instituta 7. St. Petersburg: Rossijskij Institut Istorii Iskusstv. Adèr, Lidiâ Olegovna [Адэр, Лидия Олеговна]. 2013. "Микротоновая музыка в Европе и России в 1900–1920-е годы". Non-doctoral diss. St Peterburg: Gosudarstvennaâ Konservatoriâ imeni N.A. Rimskogo-Korsakova. Akopyan, Levon. 2010. Музыка ХХ века. Энциклопедический словарь [Music of the Twentieth Century: An Academic Dictionary], 353–54. Moscow: Praktika. Amy, Gilbert. 1961. "Micro-intervalle". Encyclopédie de la musique, 3 vols., edited by François Michel in collaboration with François Lesure and Vladimir Fèdorov. Paris: Fasquelle. Anon. 1990. "Микрохроматика" [Mikrochromatika"]. Музыкальный энциклопедический словарь [Musical Encyclopedic Dictionary], 344. Moscow: Sov'etskaya Entsiklopediya. Anon. 1998. "micro-intervalle". Nouveau Larousse encyclopédique, second edition, edited by Yves Garnier. 2:1011. Paris: Larousse. ISBN 9782031531302 (set) ISBN 9782031531319 (vol. 1) ISBN 9782031531326 (vol. 2). Anon. 2006. Музыкально-теоретические системы [Musical-Theoretical Systems]. Moscow: Kompozitor. Anon. 2007. "Микрохроматические интервалы" [Mikrochromaticheskie Intervali]. Музыкальный словарь Гроува [Grove Music Dictionary], second edition, 563. Moscow: Praktika. Anon. 2016. “King Gizzard Announce a New Album, ‘’Flying Microtonal Banana’’. Heavenly Records website (accessed 29 March 2017). Anon. n.d. "Macrotonal". Xenharmonic Wiki blog at macrospaces.com (accessed 3 February 2016). Apel, Willy. 1967. The Harvard Dictionary of Music, second edition. Cambridge, Mass. : Harvard University Press. Barbera, André. 2003. "Comma, Schisma". Harvard Dictionary of Music, fourth edition, edited by Don Michael Randel, 193. Cambridge, MA; London: The Belknap Press of Harvard University Press. ISBN 978-0-674-01163-2. Barbieri, Patrizio. 2008. Enharmonic instruments and music 1470-1900. Latina, Italy: Il Levante Libreria Editrice, 2008. ISBN 978-88-95203-14-0. Battier, Marc, and Thierry Lacino. 1984. "Simulation and Extrapolation of Instrumental Sounds Using Direct Synthesis at IRCAM (A Propos of Resonance)". Contemporary Music Review 1 (Musical Thought at IRCAM, edited by Tod Machover), no. 1:77–82. Belyaev, Victor M. [Беляев, В. М.]. 1971a. "Азербайджанская народная песня (1960)" [Azerbaijan Folk Songs] , in Victor Belyaev, О музыкальном фольклоре и древней письменности [On Musical Folklore and Ancient Literature]. Moscow: Sov'etskii Kompozitor, 1971:108–56. Belyaev, Victor. 1971b, "Турецкая музыка (1934)" [Turkish Music]. In Victor Belyaev, "О музыкальном фольклоре и древней письменности". Moscow: Sov'etskii Kompozitor, 1971:163–76; abridged English version as: Victor Belaiev, "Turkish Music", The Musical Quarterly 21, no. 3 (July 1935): 356–67. Blesh, Rudi. 1946. Shining Trumpets: A History of Jazz. New York: Alfred A. Knopf. Boulez, Pierre. 1958. "'At the Ends of Fruitful Land …'", translated by Alexander Goehr. Die Reihe 1 (Electronic Music): 19–29. English edition. Capellen, Georg. 1908. Fortschrittliche Harmonie- und Melodielehre. Leipzig: C. F. Kahnt Nachfolger. Dahlhaus, Carl, Hans Heinrich Eggebrecht, and Kurt Oehl (eds). 1995. Brockhaus Riemann Musiklexikon in vier Bänden und einem Ergänzungsband, second edition, volume 4. Mainz: Atlantis-Schott Musikbuch-Verlag. Chou Wen-chung. 1971. "Asian Concepts and Twentieth-Century Western Composers". The Musical Quarterly 57, no. 2 (April): 211–29. Conti, Luca. 2005. Suoni di una terra incognita: il microtonalismo in Nord America (1900–1940). Lucca: Libreria musicale italiana. Conti, Luca. 2008. Ultracromatiche sensazioni: il microtonalismo in Europa (1840–1940). Lucca: Libreria musicale italiana. Criton, Pascale. 2010. "Variabilité et multiplicité acoustique". In Manières de faire des sons, edited by Antonia Soulez and Horacio Vaggione, 119–33. Musique-philosophie. Paris: L'Harmattan. ISBN 978-2-296-12959-7. Datta, Asoke Kumar, Ranjan Sengupta, Nityananda Dey, and Dipali Nag. 2006. "Experimental Analysis of Shrutis from Performances in Hindustani Music". Kolkata: ITC Sangeet Research Academy. ISBN 81-903818-0-6. Donval, Serge. 2006. Histoire de l'acoustique musicale. Courlay: Fuzeau. ISBN 9782841691524 (pbk). Ellis, Alexander J. 1877. "On the Measurement and Settlement of Musical Pitch". Journal of the Society of Arts 25, no. 1279 (25 May): 664–87. Gurenko, N.A. [Гуренко Н.А]. 2010. "Микрохроматика И. Вышнеградского: История, теория, практика освоения" [The Microchomatics of I. Wyschnegradsky: History, Theory, Practice, Development]. PhD diss. Ekaterinburg: Urals Mussorgsky State Conservatoire. Hába, Alois. 1921. Harmonische Grundlagen des Vierteltonsystems. Melos 3:201–209. Hába, Alois. 1922. Vývoj hudební tvorby a theorie vzhledem k diatonice, chromatice a čtvrttónové soustavě. Listy hudební matice 1:35–40, 51–57. Helmholtz, Hermann von. 1885. On the Sensations of Tone as a Physiological Basis for the Theory of Music, second English edition, translated, thoroughly revised and corrected, rendered conformable to the fourth (and last) German edition of 1877, with numerous additional notes and a new additional appendix bringing down information to 1885, and especially adapted to the use of music students by Alexander J. Ellis. London: Longmans, Green. Jedrzejewski, Franck. 2004. "Alois Hába et l'expérimentation micro-intervallique". In L'attraction et la nécessité: Musique tchèque et culture française au XXe siècle, edited by Xavier Galmiche and Lenka Stránská, foreword by Danièle Pistone, 169–75. Prague: Bärenreiter. ISBN 978-80-86385-27-3; Paris: Université Paris-Sorbonne (Paris IV). ISBN 978-80-86385-27-3. Jedrzejewski, Franck. 2014. Dictionnaire des musiques microtonales: 1892–2013, new, revised and enlarged edition. Paris: L’Harmattan. ISBN 9782343035406 (pbk). K[aplan], "Noah, and Rosie K[aplan]. 2018. “"Notes from Underground: Ivan Wyschnegradsky's Manual of Quarter-Tone Harmony". New Music Box, NY (accessed May 15, 2018). Kogut, Gennady. A. 2005. Микротоновая музыка [Microtonal Music (in Russian). Kiev: Naukova Dumka. ISBN 966-00-0604-7. Kholopov, Yuri Nikolaevich [Холопов Ю.Н.]. 1976. "Микрохроматика" [Microchromatics]. Музыкальная энциклопедия [Musical Encyclopedia] 3:587–89. Moscow: Bolshaya Sovetskaya Entsiklopedia [Great Soviet Encyclopedia]. Kholopov, Yuri N. 2003. Гармония. Теоретический курс [Harmony: Theoretical Course. St Petersburg: Lan. Klishin, A. G."Проблемы музыкального строя в начале Нового времени" [Problems of Musical Structure in the Early Modern Era], PhD diss. Moscow: Moscow Conservatory. Koenig, Laura Jeanne. 1995. "Air à la grecque: A Quarter-tone Piece for Flute in the Historical Context of the Enharmonic Genre in Eighteenth-century French Music and Theory". DMA diss. Iowa City: The University of Iowa. Maclagan, Susan J. 2009. A Dictionary for the Modern Flutist. Lanham, MS, and Plymouth: Scarecrow Press, Inc. ISBN 978-0-8108-6711-6 (cloth); ISBN 978-0-8108-6728-4 (ebook). McNaught, W. 1939. "Gramophone Notes". The Musical Times 80, no. 1152 (February): 102–104. Mann, Maud (MacCarthy). 1912. "Some Indian Conceptions of Music". Proceedings of the Musical Association, 38th Session (1911–1912) (16 January): 41–65. Meyer, Max. 1903. "Experimental Studies in the Psychology of Music". The American Journal of Psychology 14, nos. 3–4 (July–October): 192–214. Möllendorff, Willy von. 1917. Musik mit Vierteltönen. Leipzig: Verlag F. E. C. Leuckart. Murphy, Ben. 2017. "Making Waves". Electronic Sound no. 26 (January): 70–75. Nikoltsev, I. D. 2013. "Микрохроматика в системе современного музыкального мышления" [Microchomatics in Contemporary Musical Thought]. PhD diss. Moscow: Moscow conservatory. Pavlenko, Sergej Vasil'evič, Igor’ Kefalidi, and Viktor Alekseevič Ekimovskij. 2002. "Микротоновые элементы: Беседа" [Microtonal Elements: A Conversation]. Музыкальная академия [Muzykal'naâ akademiâ], no. 2:21–24. Polunina, E. N. [Полунина Е.Н.]. 2010. "Микрохроматика в музыкальном искусстве позднего Возрождения" [Microchromatics in Music of the Late Renaissance]. PhD diss. Vladivostok: Far East State Academy of Arts. Pressing, Jeff. 1992. Synthesizer Performance and Real-time Techniques. Madison: A-R Editions. ISBN 9780895792570. Prieberg, Fred K. 1958. Lexikon der Neuen Musik. Freiburg im Breisgau and Munich: K. Alber. Prieberg, Fred K. 1960. Musica ex machina: über das Verhältnis von Musik und Technik. Berlin, Frankfurt, and Vienna: Verlag Ullstein. Rae, Caroline. 2013. “Messiaen and Ohana: Parallel Preoccupations or Anxiety of Influence?” In Messiaen Perspectives 2: Techniques, Influence and Reception, edited by Robert Fallon and Christopher Dingle, 153–74. Farnham: Ashgate Publishing, Ltd. ISBN 978-1-4094-2696-7. Reilly, Edward R., and John Solum. 1992. "De Lusse, Buffardin, and an Eighteenth-Century Quarter Tone Piece". Historical Performance (Spring): 19–23. Richter, Lukas. 2001. "Diesis (ii)". The New Grove Dictionary of Music and Musicians, second edition, edite by Stanley Sadie and John Tyrrell. London: Macmillan Publishers. Riemann, Hugo. 1967. Riemann Musikexikon, twelfth fully revised edition, Band 3: Sachteil, edited by Wilibald Gurlitt and Hans Heinrich Eggebrecht. Mainz: B. Schott's Söhne. Rigoni, Michel. 1998. Karlheinz Stockhausen: ... un vaisseau lancé vers le ciel, second, revised, corrected, and enlarged edition, with a preface by Michaël Levinas. Musique de notre temps: compositeurs. [Lillebonne]: Millénaire III Éditions. ISBN 978-2-911906-02-2 (pbk). Rovner, A. A. 2010. "Сергей Протопопов: композиторское творчество и теоретические работы" [Sergey Protopopov: composer's output and theoretical works]. PhD diss. Moscow: Moscow conservatory. Rué, Roberto. 2000. "Diatonismo, cromatismo y microtonalismo: Una interpretación estructuralista". Música e investigación: Revista del Instituto Nacional de Musicología "Carlos Vega" 4, nos. 7-8:39-53. Schulter, Margo. 1998. "Pythagorean Tuning and Medieval Polyphony". Medieval Music and Arts Foundation website, Todd McComb, editor (accessed 2 February 2016). Schulter, Margo. 2001. "Xenharmonic Excursion to Padua, 1318: Marchettus, the Cadential Diesis, and Neo-Gothic Tunings". Medieval Music and Arts Foundation website, Todd McComb, editor (accessed 2 February 2016). Spring, Glenn, and Jere Hutcheson. 2013. Musical Form and Analysis: Time, Pattern, Proportion. Long Grove: Waveland Press, Inc. ISBN 9781478607229. Strangways, A. H. Fox. 1914 The Music of Hindostan . Oxford: Clarendon Press. Reprinted New Delhi: Oriental Books Reprint Corporation, 1975. Tsenova, V. S. [Ценова, В. С.] (ed.). 2007. Теория современной композиции [The Theory of Modern Composition]. Moscow: Muzyka. Von Gunden, Heidi. 1986. The Music of Ben Johnston. Metuchen, NJ, and London: The Scarecrow Press, Inc. ISBN 0-8108-1907-4. Wallon, Simone. 1980. L'allemand musicologique. Guides Musicologiques. Paris: Editions Beauchesne. ISBN 2-7010-1011-X. Whitfield, Charles. 1989. L'anglais musicologique: l'anglais des musiciens. Guides Musicologiques. Paris: Editions Beauchesne. ISBN 2-7010-1181-7. Monzo, Joe. . A Microtonal Analysis of Robert Johnson's "Drunken Hearted Man". Wyschnegradsky, Ivan. 1972. "L'Ultrachromatisme et les espaces non octaviants". La Revue Musicale nos. 290–91:71-141. Žabka, Marek. 2014. "Dancing with the Scales: Subchromatic Generated Tone Systems". Journal of Music Theory 58, no. 2 (Fall):179–233. Aron, Pietro. 1523. Thoscanello de la musica. Venice: Bernardino et Mattheo de Vitali. Facsimile edition, Monuments of music and music literature in facsimile: Second series, Music literature 69. New York: Broude Brothers, 1969. Second edition, as Toscanello in musica... nuovamente stampato con laggiunta da lui fatta et con diligentia corretto, Venice: Bernardino & Matheo de Vitali, 1529. Facsimile reprint, Bibliotheca musica Bononiensis, sezione 2., n. 10. Bologna: Forni Editori, 1969. Online edition of the 1529 text (in Italian). Third edition, as Toscanello in musica, Venice: Marchio Stessa, 1539. Facsimile edition, edited by Georg Frey. Kassel: Bärenreiter, 1970. Fourth edition, Venice, 1562. English edition, as Toscanello in music, translated by Peter Bergquist. 3 vols. Colorado College Music Press Translations, no. 4. Colorado Springs: Colorado College Music Press, 1970. Colonna, Fabio. 1618. La sambuca lincea, overo Dell'istromento musico perfetto. Naples: C. Vitale. Facsimile reprint of a copy containing manuscript critical annotations by Scipione Stella (1618–1624), with an introduction by Patrizio Barbieri. Musurgiana 24. Lucca, Italy: Libreria Musicale Italiana, 1991. Daniels, Arthur Michael. 1965. "Microtonality and Mean-Tone Temperament in the Harmonic System of Francisco Salinas". Journal of Music Theory 9, no. 1 (Spring): 2–51. Fritsch, Johannes G. 2007. "Allgemeine Harmonik, Tonsysteme, Mikrotonalität: Ein geschichtlicher Überblick". In Orientierungen: Wege im Pluralismus der Gegenwartsmusik, edited by Jörn Peter Hiekel, 107–22. Veröffentlichungen des Instituts für Neue Musik und Musikerziehung Darmstadt 47. Mainz: Schott Musik International. ISBN 978-3-7957-1837-4. Haas, Georg Friedrich. 2007. "Mikrotonalität und spektrale Musik seit 1980". In Orientierungen: Wege im Pluralismus der Gegenwartsmusik, edited by Jörn Peter Hiekel, 123–29. Veröffentlichungen des Instituts für Neue Musik und Musikerziehung Darmstadt 47. Mainz: Schott Musik International. ISBN 978-3-7957-1837-4. Hába, Alois. 1927. Neue Harmonielehre des diatonischen, chromatischen Viertel-, Drittel-, Sechstel- und Zwölftel-tonsystems. Leipzig: Kistner & Siegel. Jedrzejewski, Franck. 2014. Dictionnaire des musiques microtonales. Nouvelle édition revue et augmentée (1892–2013) [Dictionary of Microtonal Musics]. Paris: L'Harmattan. ISBN 978-2343035406. Kotschy, Johannes. 2008. "Mikrotonalität: Eine Zeiterscheinung?" Österreichische Musikzeitschrift 63, no. 7 (July): 8–15. Leedy, Douglas. 1991. "A Venerable Temperament Rediscovered". Perspectives of New Music 29, no. 2 (Summer): 202–11. Mosch, Ulrich. 2008. "Ultrachromatik und Mikrotonalität: Hans Zenders Grundlegung einer neuen Harmonik". In Hans Zender: Vielstimmig in sich, edited by Werner Grünzweig, Anouk Jeschke, and Jörn Peter Hiekel, 61–76. Archive zur Musik des 20. Jahrhunderts, No. 12. Hofheim:Wolke. ISBN 978-3-936000-25-2. Stahnke, Manfred. 2010. "About Backyards and Limbos: Microtonality Revisited". In Concepts, Experiments and Fieldwork: Studies in Systematic Musicology and Ethnomusicology, edited by Rolf Bader, Christiane Neuhaus, and Ulrich Morgenstern, with a prefaceby Achim Reichel, 297–314. Frankfurt am Main and New York: Peter Lang. ISBN 978-3-631-58902-1. Werntz, Julia. 2001. "Adding Pitches: Some New Thoughts, Ten Years after Perspectives of New Music's 'Forum: Microtonality Today'". Perspectives of New Music 39, no. 2 (Summer): 159–210. Wood, James. 1986. "Microtonality: Aesthetics and Practicality". The Musical Times 127, no. 1719 (June): 328–30. Zweifel, Paul. 1996. "Generalized Diatonic and Pentatonic Scales: A Group-Theoretic Approach". Perspectives of New Music 34, no. 1 (Winter): 140–61. Wikimedia Commons has media related to Microtonal music. Wilson, Erv. "Wilson Archives of papers on microtonal theory"